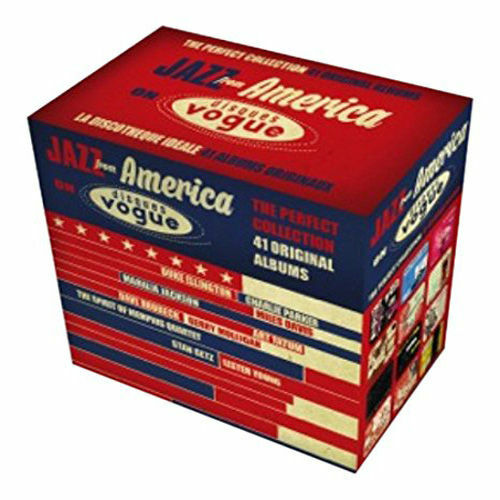 42 original albums (+4 EPs and 27 Singles) gathered on 20CDs 'Jazz From America On Disques Vogue' reviews the revolutionary passage from the 78 rpm to the Long-Play era. A totally cool little package - one that features 20 different CDs, each done as a different tiny replica of a 10" LP that originally appeared on the Vogue Records label overseas! Vogue was well-known for recording important sessions by American jazzmen in Paris in the early 50s - but this package brings together work that was recorded in America by many of the same artists, and issued by Vogue in unique packages overseas - many of which are replicated here, along with bonus material too! The set features 20 CDs, but includes 40 different albums - as each CD features tracks from original 10" album releases - with full details on tracks, personnel, and other information in the large booklet provided - a great complement to the records by artists who include Stan Getz, Gerry Mulligan, Red Norvo, Lester Young, Mahalia Jackson, Spirit Of Memphis Quartet, Wynonie Harris, Earl Bostic, Charlie Parker, Charlie Christian, Art Tatum, Erroll Garner, Sidney Bechet, Miles Davis, and others!